Last month I addressed a conference of German book publishing production staff. This annual event, Arbeitstagung der Herstellungsleiter, has been held for almost 30 years and with over 100 delegates meeting over 3 days, it has to be said that as an event it is in robust health itself. The reason I mention the conference is that as I prepared my presentation, it became increasingly clear that far from seeing a decline in book printing, we are seeing a strengthened book printing industry, just different. What is striking is that it is digital communications that is driving the fundamental changes in the book publishing market and it is digital print that is allowing book printers to respond well and offer a range of fresh services that will ensure book printing itself remains in robust health. Without throwing a mass of statistics into this short blog, may I simply state that book publishers need readers. Globally the population is both growing in both numbers and literacy levels, thanks to raising economic standards. This growth will be particularly noticeable in Asia and Africa. Even in the developed regions where such growth is minimal eg North America and Europe, book reading thrives despite the ever present digital screens that we all spend so much time on. For digital communications has strengthened book publishing as well. Hence there is the rise and rise of so-called ‘self-publishing’. This is a poor description; I prefer to say publishing by individuals or organisations that would not describe themselves as book publishers. Hence there are approximately 12x the number of ‘active’ publishers in the US as there are organisations that describe themselves to the US government as ‘book publishers’. Then again in 2011 there were 347,000 new titles published in the US but 1,500,000 titles available as ‘reprint or Print on Demand’, many of which in the past would have long gone ‘out of print’. Of those c.1.8m titles available, 78% sold less that 100 copies and only 238 sold more than 100,000 copies. In 2013, 42% of all books sold in the US [hard copy and eBooks] were sold on line – a trend that seems bound to increase. Then of course there is the thorny question of e-Books themselves. E-books will continue to develop, read either on readers or tablets and next year the number of eBooks sold in the US will exceed the number of hard copy books sold. Yet the number of e-readers sold is in steady decline. But what about tablets you query? Have you tried to read a length book on a tablet? So why my confident claim that book printing is in robust health? Because of digital print and how it is evolving. Ink jet is increasing the economic range of run length, mono but colour. And advances in automation are increasingly making the book run of one economic, not just for the specialist but also for most book printers. Which brings me to the one chart I will include in the blog. 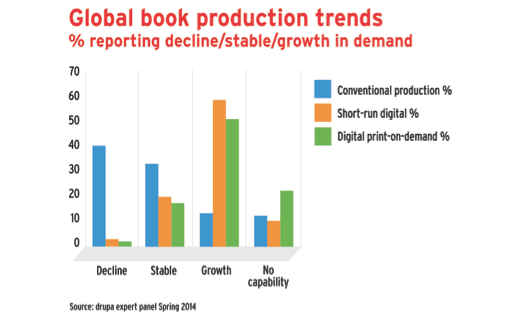 This is the result of question to a global panel of book printers as part of the drupa Global Insight survey on Print applications that can create growth, published in Spring 2014. It shows that whilst conventional litho book printing is in wide but not universal decline, short run digital production and on-demand digital production are both enjoying growing demand. Next month’s drupa show in Duesseldorf will allow all book printers to see the latest combination of prepress, press and finishing that will allow them to exploit this opportunity.